Bring in a week of cricket! Our amazing IFL menu continues with food that’s sure to get you ‘Bowled Over’. Why worry about your game-time food when we’ve already got it covered! 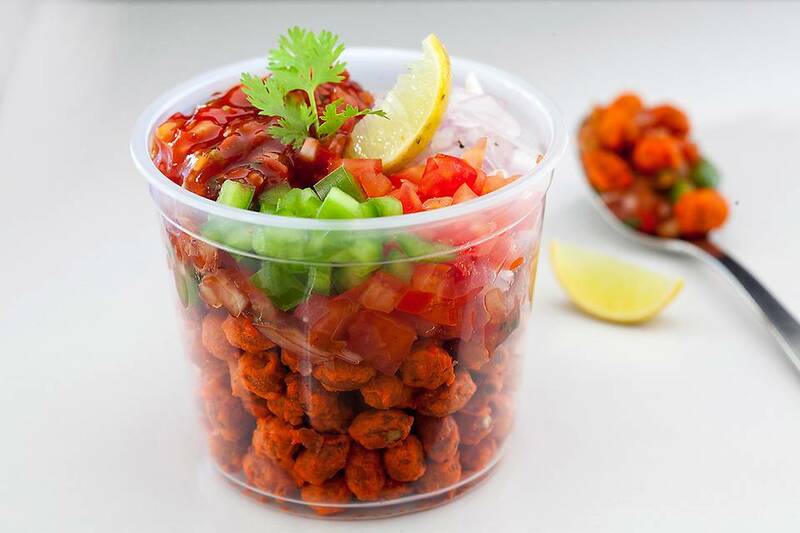 peanuts tossed with onion, tomatoes, bell pepper and green chilis are tossed with chaat masala and finished off with a dash of lemon juice. Snack away! Let’s just say that the word appetizer was derived from two words – appetite teasers. And a box of Googly Chicken Twisters is designed to do just that! Strips of chicken breast, seasoned with lemon juice, woodfire spice and pepper are panko crumbed, deep fried are tossed with the vivacious pair of oregano and paprika, before being drizzled generously with cheese sauce. Kimchi is, of course, an acquired taste but, hey, the Koreans devised this meal to stay full during the most bitter of winter days! Kimchi that we know today is a result of several ancestral kimchi recipes put together. Crunchy batter-fried baby corn, peppers and Kimchi essentials cabbage and bok choy are tossed in a daring, luscious chili sauce spiced further with Sriracha. Finished off with a dash of rice-wine vinegar, sesame oil, spring onions and crushed, toasted peanuts, here’s a delicious Korean-style appetizer! thalis. We’ve recreated all the zesty and age-old flavours of a popular meat preparation - Lal Murgh Biriyani. Succulent chunks of deboned chicken, spiced with freshly ground biriyani masala are taken to the fiery end with both red and green chillies. Layers of flavoured and seasoned basmati blanket the lal murgh curry, before being steamed to a fluff and served with a homely raita. Catch these delicious dishes only on FreshMenu.com. Check out our website and order food online today!